A man looking for advice from the U.S. Secretary of defense on how to get the chip out of his head was arrested near the White House on Sunday, Sept. 24, after police discovered a trunkload of guns in his car. The man was arrested in the 700 Block of 17th St, NW at 7:15 a.m. after police on foot patrol in full uniform observed him urinating in public. When officers approached the man, he said he “came to the White House in order to speak with Adm. Mike Rogers and Gen. Jim Mattis for advice on missing paychecks and how to get the dog chip out of my head,” according to an incident report D.C. metro police provided to The Epoch Times. Two more officers arrived at the scene and asked if they could search the suspect’s Silver 2009 Nissan 370Z bearing Tennesee plates with Fraternal Order of Police tags. They asked if they could also search the trunk, and he gave permission, saying “Yes, I don’t care,” according to the report. The officers saw three hard gun cases in plain view and called in the United States Secret Service Uniformed Division Crime Scene Unit to do a more thorough search and document the situation. The suspect was then arrested on six charges including possession of a prohibited weapon, carrying a pistol without a license, possession of an unregistered firearm or destructive device, and unlawful transportation of a firearm. The man’s small armory comprised nine guns: a Glock 30, .357 Rossi, .40 Smith & Wesson, M-4 Bushmaster, .45 V10 Vulcan, a TEC-9 with a silencer, a .45 XDS, AK-47 Platform Norinco, and a .45 Smith & Wesson. He also had three knives, some brass knuckles, and a black jack. He was arrested outside the Smithsonian’s Renwick Gallery, about 350 yards from the White House. The suspect was taken to a D.C. facility “for mental observation,” according to the report and then taken to a D.C. police station, where he was charged with multiple weapons violations. Police have not yet released his name or said whether he was previously known to law enforcement. 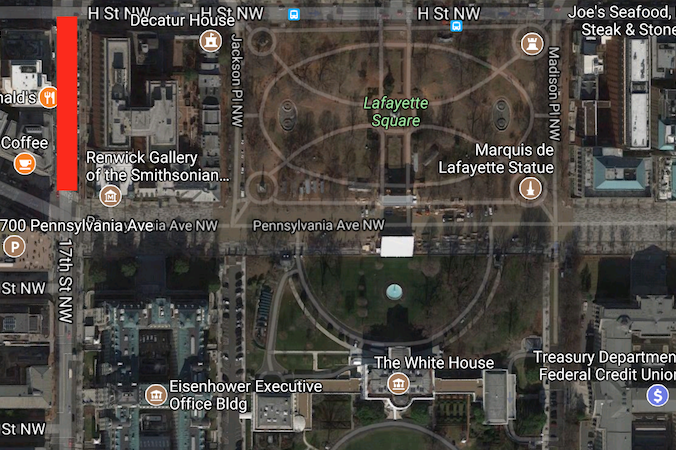 It’s not the only recent arrest of a man with multiple weapons near the White House. On May 31, a man was arrested after he left a Bushmaster carbine rifle similar to the M4 in plain view in his car while he stayed at the Trump Hotel near the White House. Police also found a Glock 23 in his glove box. The man was charged with possession of firearms without a license and illegal possession of ammunition. 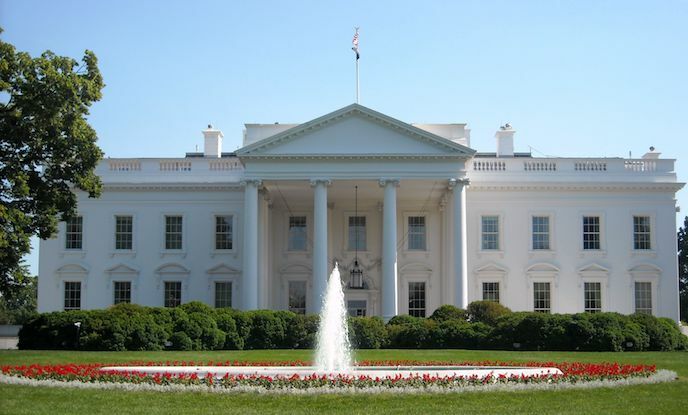 A year earlier, another man was shot by a secret service officer after he walked up to a guard booth at the White House with a pistol that he refused to put down. One retired Secret Service officer told NBC he blamed the increasingly polarized political climate for the rise in such incidents.